White Slave depicts the helplessness of a young girl being sold into prostitution. The artist based the auctioneer’s pose on an experience she once had in Puerto Rico: seeing a sea gull clenched in the outstretched hand of a woman trying to sell it, Eberle, moved by compassion, bought the bird herself and freed it. Like the bird, the young girl is subject to the cruelty of others, lacking the agency to free herself. White Slave reflects Eberle’s interest in women’s issues and social justice. She was an active proponent of the progressive movement, a suffragette and follower of the prominent social reformer Jane Addams. Eberle had a strong sense of social responsibility as an artist and individual, and White Slave demonstrated an unprecedented level of social comment in her work. Eberle chose to debut White Slave at the Armory show; she had conceived of the sculpture four years earlier but did not begin to model the group until she was invited to submit to the exhibition. The other sculpture she exhibited there was Girls Wading, a Coney Island beach scene that represented more typical subject matter for her. When The Survey featured White Slave on its cover in May 1913, the journal received countless letters alternately condemning or lauding the sculpture. White slavery, a euphemism for forced female prostitution, was at the forefront of the public consciousness in the early twentieth century. In 1910 the Mann Act prohibited the interstate trafficking of women and in 1911 the Chicago Vice Commission’s report on prostitution in that city alarmed the nation. Elizabeth Robins’ 1913 book My Little Sister, which chronicled the abduction of a young girl, brought the issue to a popular audience. Robert Jermian Cole, “Slave Is Revelation of Charm in Macbeth Galleries,” New York Telegraph, April 26, 1925. Louise R. Noun, Abestenia St. Leger Eberle, Sculptor (1878-1942), exh. cat. (Des Moines: Des Moines Art Center, 1980), 14. “A Sculptress Who Has Caught the American Rhythm,” Current Opinion, 55, No. 2 (August 1913): 125. Letter to the Editor in “Communications,” The Survey, Vol. 30, No. 9 (May 31, 1913): 311-314; Letter to the Editor in “Communications,” The Survey, Vol. 30, No. 11 (June 14, 1913): 381-83; and Letter to Editor in “Communications,” The Survey, Vol. 30, No. 15 (July 12, 1913): 507-510. The sculpture of Abastenia St. Leger Eberle features the same urban realist subject matter as the paintings of the Ashcan School artists. Though Eberle did not work in conjunction with the Ashcan artists, she moved in the same circles: from 1899 to 1902 she attended the Art Students League; and beginning in 1907, she was associated with the Macbeth Gallery, which mounted the influential exhibition of “The Eight” urban realist painters in 1908. Inspired by the bustling life of Manhattan’s Lower East Side, Eberle’s small-scale genre pieces depicting immigrants and the urban poor won her acclaim. Dispensing with the hackneyed repertoire of historic models, she expressed her dedication to modern subjects: “It is the beauty that is in the world today that appeals to me—not what may have existed centuries ago in Greece…We are trying to find new bottles for new wine- Greek vases are about worn out.”  Works like Girl Skating, which was purchased by the Metropolitan Museum of Art in 1909, demonstrate Eberle’s ability to find joy and beauty in the mundane aspects of modern life. 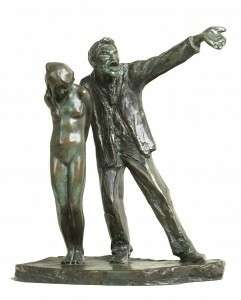 Eberle exhibited two sculptures at the 1913 Armory Show. Girls Wading, a Coney Island beach scene, was in keeping with the artist’s previous genre groups. White Slave, however, demonstrated a level of social comment that was unprecedented in Eberle’s sculptural output. Louise R. Noun, Abestenia St. Leger Eberle, Sculptor (1878-1942), exh. cat. (Des Moines: Des Moines Art Center, 1980), 10. Christina Merriman, “New Bottles for New Wine: The Work of Abastenia St. Leger Eberle,” The Survey, 30, No. 5 (May 3, 1913): 198-199.